Gov. David Ige (wearing lei) was joined at the signing ceremony by Honolulu Mayor Kirk Caldwell (to Ige’s left) and representatives of the mayors of Maui, Kauai and the Big Island. HONOLULU – In a show of support for the Paris climate agreement, Gov. David Ige and Hawaii’s county mayors and representatives gathered Tuesday for the signing of two bills and a mayors’ agreement that support the commitments and goals of the Paris Climate Accord. Hawaii is the first state in the nation to enact legislation that implements portions of the Paris agreement. 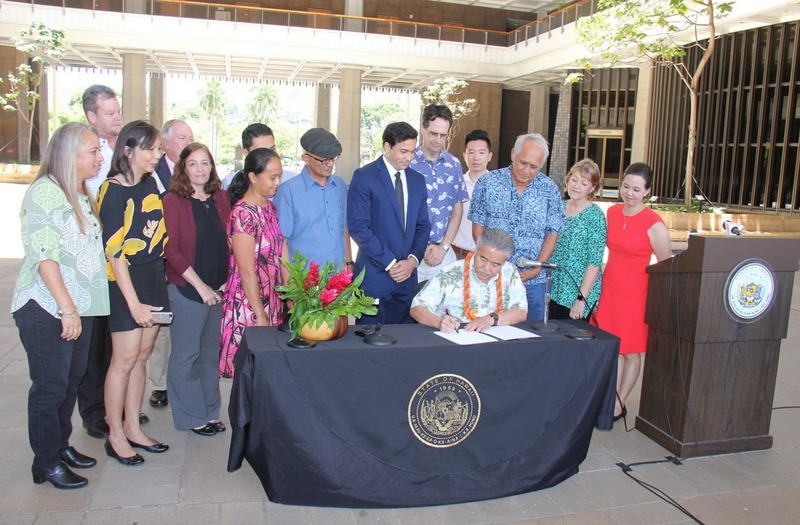 Ige signed SB 559 (Act 032), which expands strategies and mechanisms to reduce greenhouse gas emissions statewide in alignment with the principles and goals adopted in the Paris agreement. The governor also signed HB 1578 (Act 033), which establishes the Carbon Farming Task Force within the Office of Planning to identify agricultural and aquacultural practices to improve soil health and promote carbon sequestration – the capture and long-term storage of atmospheric carbon dioxide to mitigate climate change. “The measure adopted relevant sections of the Paris agreement as state law, which gives us legal basis to continue adaptation and mitigation strategies for Hawaii, despite the federal government’s withdrawal from the treaty,” said Sen. J. Kalani English, senate majority leader who introduced SB 559. 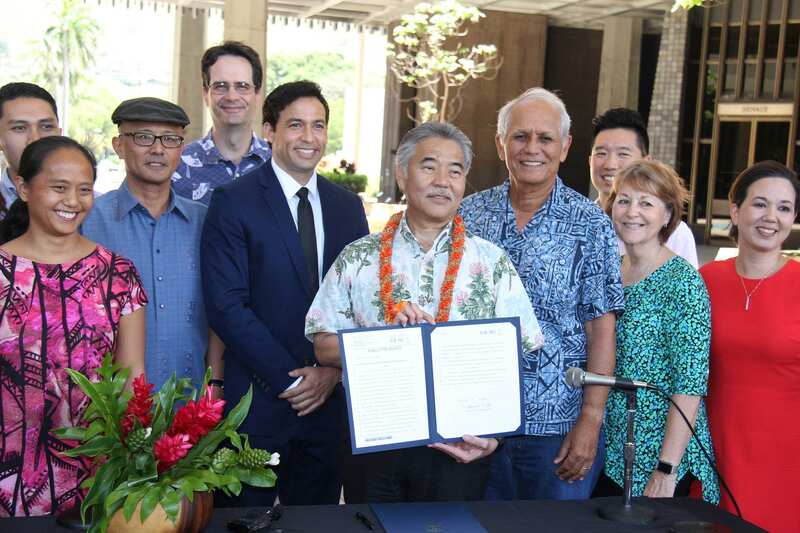 In addition, Honolulu Mayor Kirk Caldwell and representatives for Hawaii Island Mayor Harry Kim, Maui Mayor Alan Arakawa, and Kauai Mayor Bernard Carvalho signed a statement declaring their commitment to continue supporting of the Paris agreement.